Dr. Lalloo qualified from the Royal College of Surgeons in Dublin. 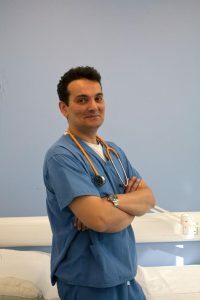 He has a fellowship in surgery from the Royal College of Surgeons Edinburgh and is a fully qualified GP with an interest in skin surgery and dermatology. His registered qualifications with the Irish Medical Council are MBBCh, FRCS Edinburgh, MICGP. Dr Lalloo is on the specialist register with the Irish Medical Council. Dr. Lalloo is a recognised expert in medical aesthetics having established Cosmedics Clinic in 2002 when medical aesthetics was in its infancy in Ireland. He is a member of the British College of Aesthetic Medicine and on the committee of the Primary Care Surgical Association. He has appeared on the Late Late Show performing his unique face and body lifting. Dr Lalloo is committed to the highest standards of aesthetic treatments and all consultations, treatments and follow up are done by himself, a highly personal approach ensuring patient satisfaction and safety. Dr Lalloo provides a wide range of anti-aging treatments with expertise in dermal fillers, non-surgical neck and facelifts, anti-wrinkle injections and non-surgical eye lifts.